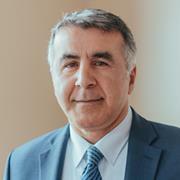 Keya Sadeghipour was appointed acting dean of the College of Engineering in 1998 and became dean in 2003. In 2005, while a search for a permanent dean was conducted, he also served the College of Science and Technology as its interim dean until January 2007. His current research interests are in the areas of dental materials (NIH), Bioengineering (various sources), and Intelligent Manufacturing Systems. He has guided several research and industrial related projects and been involved in receiving over $8M funding from various industry and government sources. He has also been the principal author of numerous papers in national and international journals and publications. At Temple, he received the Exceptional Research Award. National and international organizations to which he belongs include the American Society of Mechanical Engineers (ASME), the International Association for Dental Research (IADR), and the Society of Manufacturing Engineering (SME). He is a Program Evaluator for ABET. Silage, D.A. & Sadeghipour, K. (2017). EE and ME - Together again: Forging a BSE from BSEE and BSME programs. ASEE Annual Conference and Exposition, Conference Proceedings, 2017-June. Brookstein, D. & Sadeghipour, K. (2016). Shaping new student identity as "creatives" in the 21st century global economy. ASEE Annual Conference and Exposition, Conference Proceedings, 2016-June. Silage, D.A. & Sadeghipour, K. (2016). ME for EEs - Where are all the ME courses in the EE curriculum? ASEE Annual Conference and Exposition, Conference Proceedings, 2016-June. Bracey, J., Sadeghipour, K., Baugh, C., & Fagan, S. (2016). Chasing the holy grail: Successful academic persistence and retention of highly motivated first-year engineering students. ASEE Annual Conference and Exposition, Conference Proceedings, 2016-June.